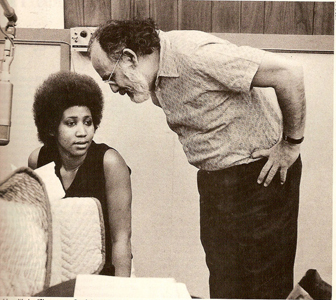 Music industry legend Jerry Wexler, who kick-started his career as a Billboard journalist in the late 1940s and went on to cultivate the careers of Ray Charles, Aretha Franklin and Led Zeppelin while a partner at Atlantic Records, has died at the age of 91 at his home in Siesta Key, Fla.
Wexler was born on Jan. 10, 1917, into a Jewish family in the Bronx. After graduating from the school now known as Kansas State University and spending a stint in the Army, he was hired in 1947 at BMI, writing continuity copy for radio stations and plugging the organization’s songs. Later that year a friend recommended him to Billboard, where he was hired with a starting pay of $75 a week. At Billboard, Wexler invented the term “rhythm & blues” to replace the name “race records,” which was then the name of the chart tracking such music. He stayed at Billboard until 1951, when he went to work for Big Three, the music publishing arm of MGM Records. The following year, Atlantic Records tried to recruit him, but Wexler said he would only join if he was made a partner, and nothing happened. A year later, when co-founder Herb Abramson joined the Army, Atlantic came back with another offer and this time agreed to take him in as a partner. Atlantic had already established itself as an up-and-coming R&B label thanks to hits from artists like Ruth Brown, Joe Turner, Stick McGhee and the Clovers, with the just-signed Ray Charles waiting in the wings. If Atlantic founders Abramson and Ahmet and Nesuhi Ertegun led the way into exploring rhythm and blues, it would be Wexler who ultimately led the label deep into Southern soul. In 1965, he signed a distribution deal for Memphis-based Satellite Records, which was putting out songs by Carla Thomas. That label would later become known as Stax. Before long, Stax began a golden era of hits from Wilson Pickett, Sam & Dave, Otis Redding, Eddie Floyd and William Bell, among others. In the 1960s, he notably recorded Wilson Pickett and Aretha Franklin, and oversaw production of Dusty Springfield’s highly acclaimed Dusty in Memphis album. He also cultivated a tight relationship with Stax Records, was an enormous proponent of the then-developing Muscle Shoals Sound and founded the fortunes of Muscle Shoals Sound Studios and the Muscle Shoals Rhythm Section. His work in this decade put Atlantic at the forefront of soul music. In 1968, he and Ahmet Ertegun signed Led Zeppelin to Atlantic Records on the strength of a demo tape played by the band’s manager Peter Grant and from what they knew of the band’s guitarist, Jimmy Page from his performances with The Yardbirds. The first artist he brought to Muscle Shoals was Aretha Franklin, whose 1967 debut, “I Never Loved a Man the Way I Love You,” redefined soul music. As the ’60s wore on, Wexler grew more involved with producing and much less with running Atlantic, although he was still closely involved in signing Led Zeppelin, the J. Geils Band and Donnie Hathaway. In 1975 Wexler left Atlantic Records for Warner Bros. Records. In 1979, Wexler produced Bob Dylan’s controversial first “born again” album, Slow Train Coming, at Muscle Shoals; a single from that album, “Gotta Serve Somebody”, would win a Grammy in 1980. In the early 1980s, Wexler would record with UK popstar George Michael. The most famous outtake of these sessions would prove to be a rare early version of “Careless Whisper” (also recorded in Muscle Shoals). The version was originally released as “Special Mix” on an early pressing of the single’s 12″. In his autobiography, Wexler says that with the help of Karen Berg, they signed the B-52’s, Dire Straits and Gang Of Four. During the latter half of the 1970s, Wexler produced Etta James’ “Deep in the Night,” Bob Dylan’s Christian album, “Slow Train Coming,” Kim Carnes “Sailin'” and Dire Straits “Communique,” among others.